All that pretty teal and coral and pink and purple almost makes you forget that Elves was ever canceled! Almost. Eight bags! Not only is this bus big, it’s DENSE. 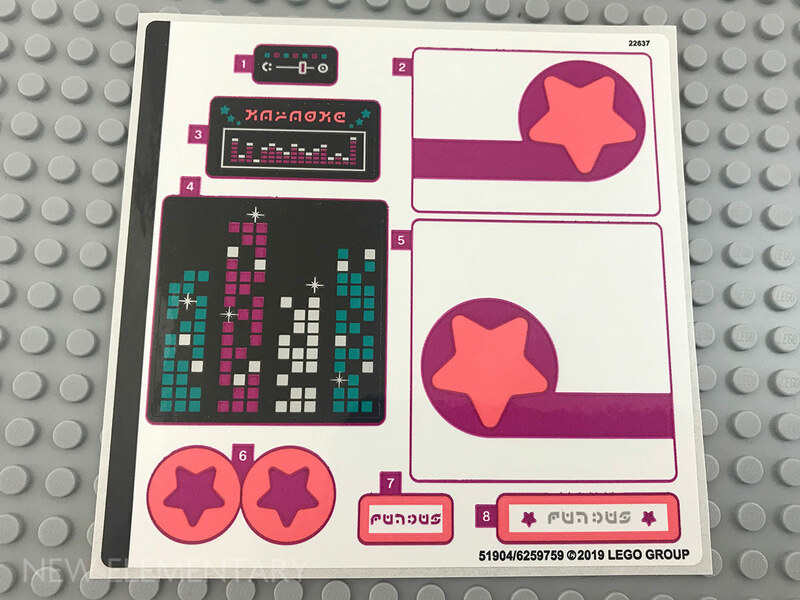 There is a single sticker sheet. Note the mysterious rune lettering; looks like it says “KARAOKE” on the one with the equalizer, and “FUNBUS” on the license plates. This is a parts blog, right? I know why you’re here. Let’s start with recolors. Nothing terribly exciting here on its own, although new windscreens always result in fancy spaceships. 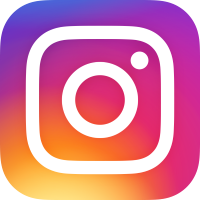 It’s nice to see the teal palette rounded out a bit more, particularly the 1x2 and 2x2 curved slopes. A new gear system! This set has the 2x2 and 6x6, and there's also a 4x4 coming. The larger ones fit with either the 4x4 turntable base (Design ID 61485) or the new 2x2 turntable base (27448); the small one only works with the 2x2 version. The center holes, like those in 4x4 round plates (60474), will only fit a stud loosely. 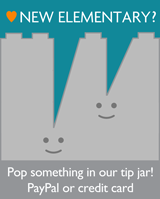 The new SNOT bracket have been covered recently but worth noting this set has it in Medium Stone Grey [TLG]/ Light Bluish Gray [BL]. Unfortunately I don’t have one of the original afros to compare to but this new one is larger, made of rubber, and has a pin-hole on top! The new 1x6x7 arch doorway is a bit prefab for my tastes, but is certainly “cleaner” than previous large door frames, i.e. without hinges or clips or stone textures. The curve of the arch matches the existing 1x6x2 arch (Design ID 15254, shown below in gray) on stilts perfectly. Perhaps a possible reason for the introduction of this part are Disney sets, which sometimes feature a "Build and Swap" modular concept (such as 41162 Ariel, Aurora, and Tiana's Royal Celebration). These modules often use arches but as they are built on a 8x8 footprint, this leaves little room for adding sufficient stability to the structure to withstand play. Having this new single arch doorway piece, with 1x1 cutouts in the top corners, offers that stability. At two plates high, it’s a half-plate shorter than the "D" tile (24246) when placed on its side. And with some wiggle room for part tolerances, it fills the space under the 1x3 arch (Design ID 4490) rather well. The new version has a groove around the edge, and walls instead of 3 tubes. And, of course, this set has a ridiculous amount of Vibrant Coral. 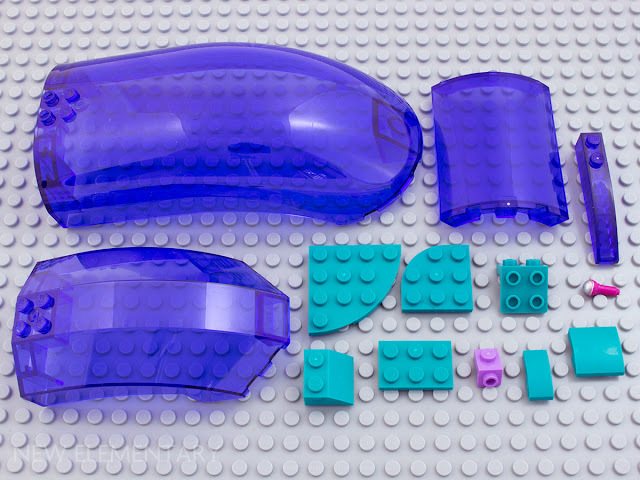 I’m not sure if I’ve ever seen a new color debut with so many parts in a single set. 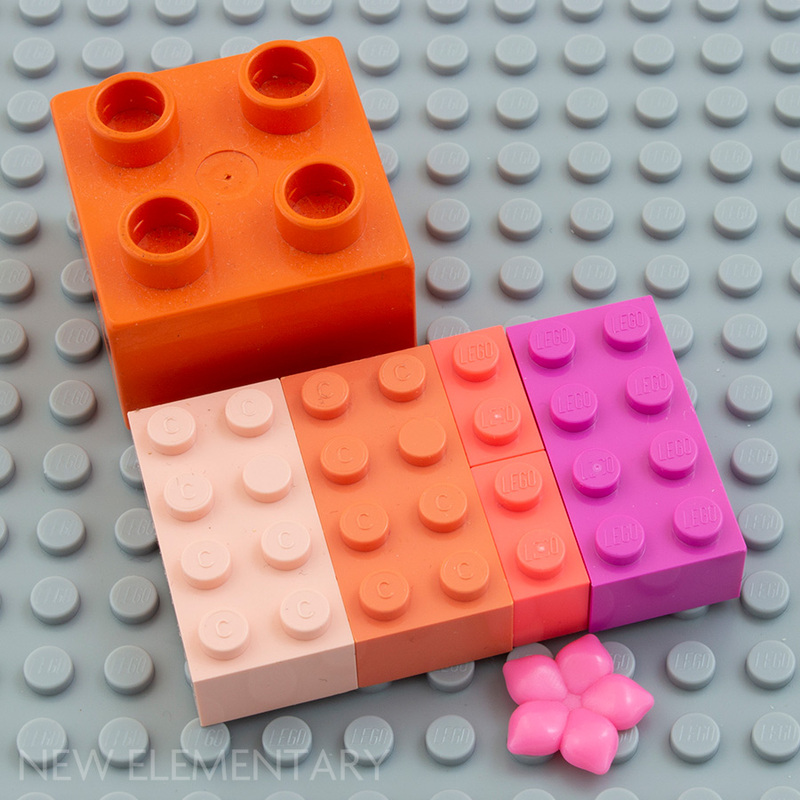 Here is 353 Vibrant Coral (the 1x2 bricks) compared to 123 Bright Reddish Orange (BL: Duplo Salmon), 100 Light Red (Light Salmon), 101 Medium Red (Salmon), 221 Bright Purple (Dark Pink), and Clikits’ 295 Flamingo Pink. 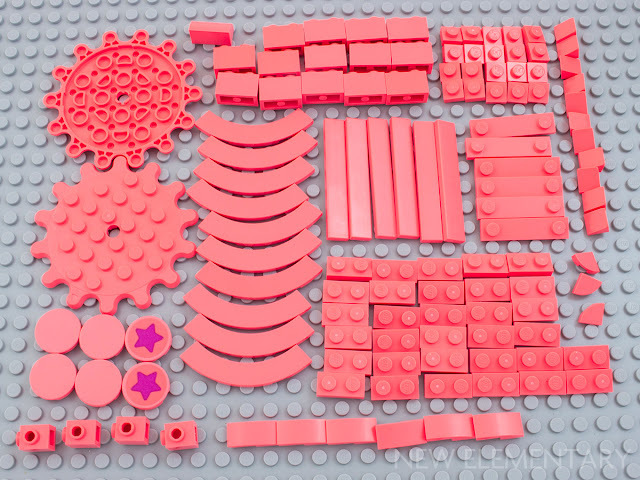 Unexpectedly, The LEGO Group have called this colour simply "Coral" in their database of replacement parts, and it seems as a consequence both Brickset and BrickLink are calling it Coral in their parts databases too. However it has been confirmed that Vibrant Coral is indeed the official TLG name for the colour, so presumably they just shortened it for the database. 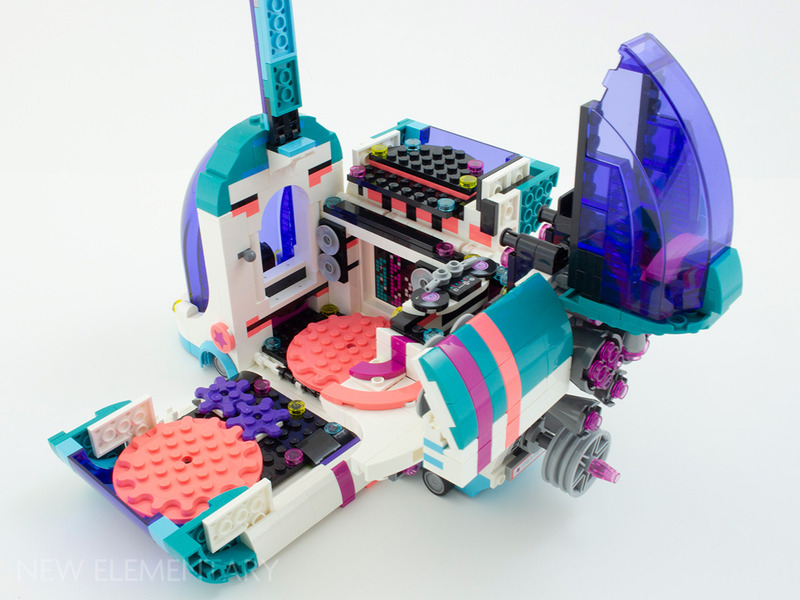 But unfolded like a Polly Pocket, it becomes a discotheque on wheels. The bus’s big surprise feature is its disco lighting effect. Pushing in the gray wheel below the jets turns on a regular red 2x3 light brick — but turning the wheel spins both the central dance platform and a dragon egg bottom in Transparent Bright Orange [TLG]/ Trans-Light Orange [BL] (Design ID 24130), refracting the light in all sorts of groovy ways. Not since the UFO sets in the 1990s have I seen such a good light show put on by a LEGO set! New set. New parts. Disco lights. The perfect review! What could be the point of the remolding of 92593? It only restricts its usefulness. I'm not sure, but one possible reason may be to prevent it from being confused with the standard 1x4 plate, which is very similar looking from the underside. 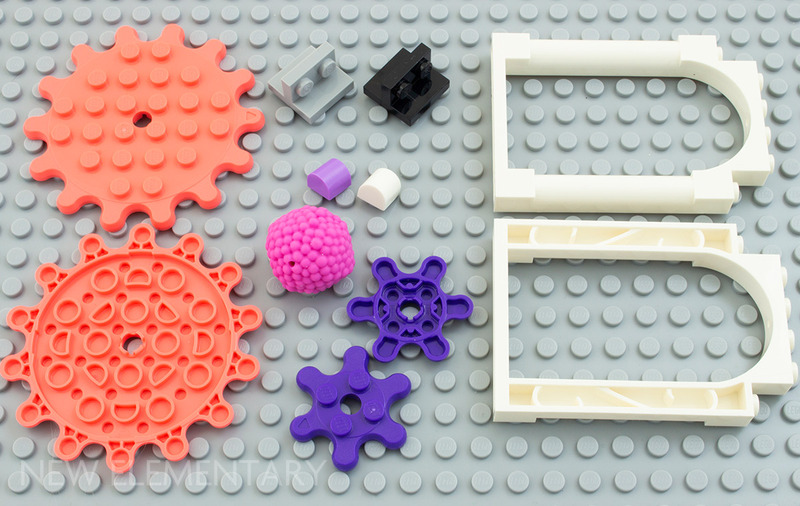 If you were to confuse the two in the course of a build you might end up with the wrong one later on (and even if you weren't, it might still make finding the correct one in a pile of parts more challenging). One immediate advantage of the new design I can spot is that the addition of a groove makes it so that one of this part's most common uses (as a loose connection between separating floors like in the modular buildings) will no longer leave such an obvious external discrepancy between 1x4 plates with two studs and the tiles used to round out the rest of the perimeter walls. Having used the current version of this part for topping off walls, I have observed quite a few instances where pulling off the level above pulls one or more off so something that makes it more grippy on the bottom is welcome. Yeah but I can imagine an enhanced clutch with a simple, slightly larger dot as well. I hadn't spotted the groove, yeah it has pro's & con's I guess. And hey, there are enough of the old style on the market now, so both are welcome afterall. 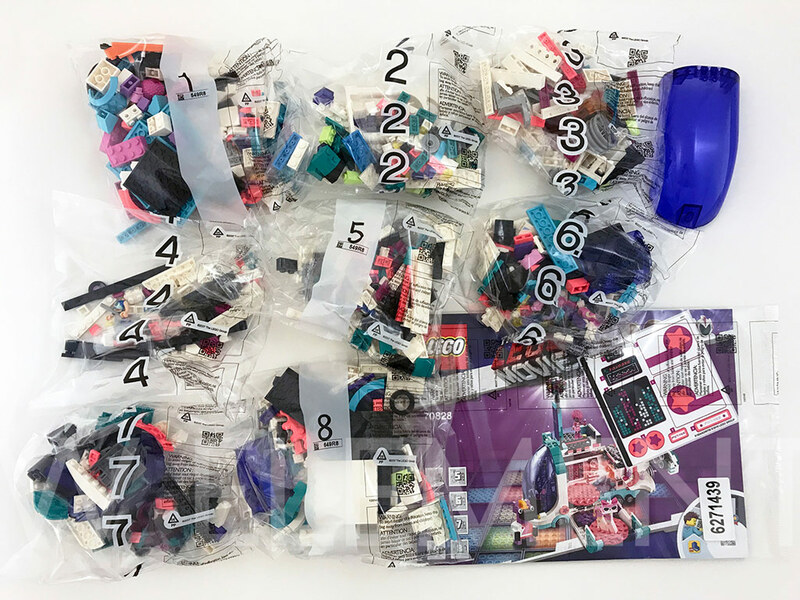 But Andrew has a point, and it could also be effective with Lego's automated sorting. Afterall when you get a missing part in a set, generally you get another lookalike part that was confused by the computer. Perhaps this also helps their recognition? I don't know about the automated sorting bit—from my experience when you get a missing part that is replaced by a different part, it's not the part's visual appearance but rather its weight that gets things confused. For instance, back in 2006 my younger brother got a Bionicle set that was missing a very distinctive silver shoulder armor piece and had a standard red 2x4 brick in its place. Visually, the parts were unmistakable for one another, but their weight was about the same. Ah weird, the rare times I've gotten a missing part, there was a visually similar one instead. I can't imagine differenciating parts by weight only to be that reliable. Just recently got this set myself—it's fantastic! 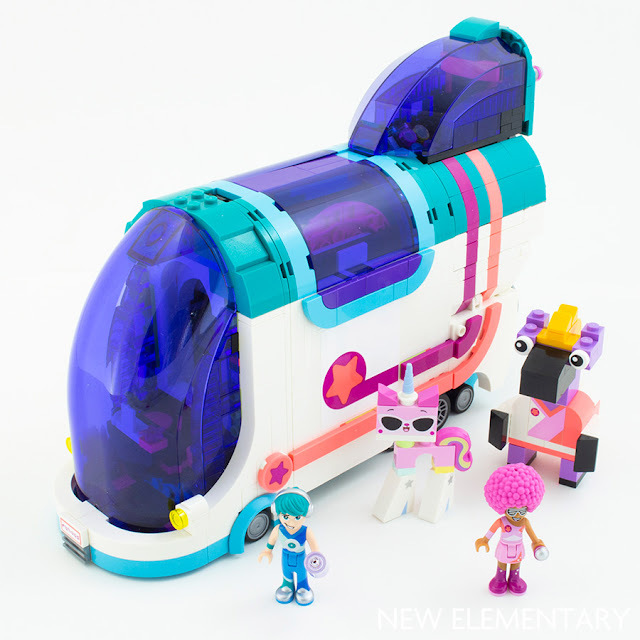 Not only does it have an abundance of new parts, great figures, and a great light brick function, it's also packed with other interesting building techniques. I love how the curve of the glass canopy is continued through to the fold-out speakers using bow bricks, hinges, and cheese slopes! The new gear plates are amazing and represent a novel new way of transferring rotation horizontally in a System build without having to conceal a bulky Technic mechanism. 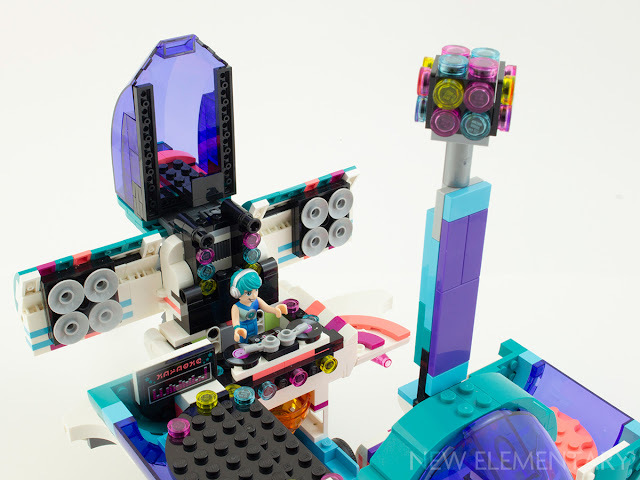 This set does also show how it can be integrated with Technic, though, via the gearing for the lighting function. The new arched doorway is a bit bulky for my taste, but I can't help but wish the standard 1x6x2 arch had those useful 1x1 cutouts. 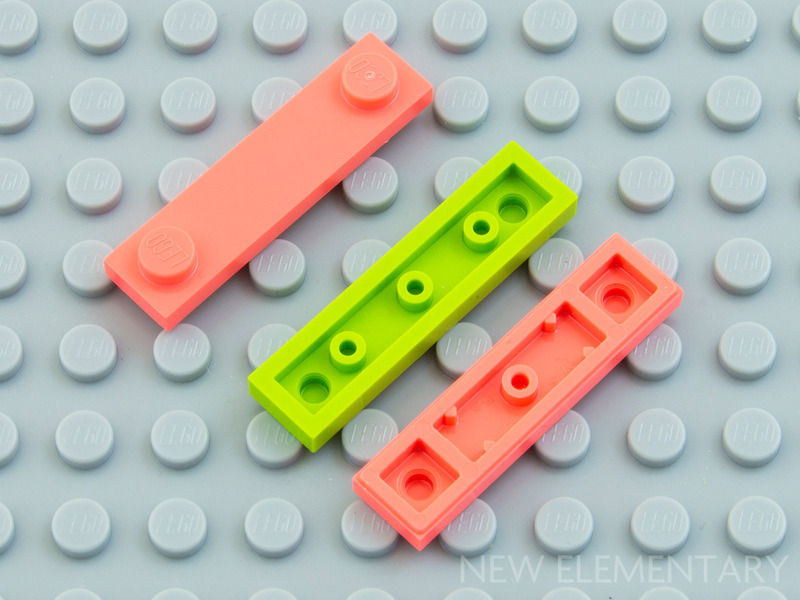 The new SNOT brackets are very useful, considering how difficult it could sometimes be to add anti-studs to the side of a System build using SNOT techniques before. The 1x1 half-circle bow is also great, and I hadn't even considered how perfectly it'd fill the space in the 1x3 arch brick! 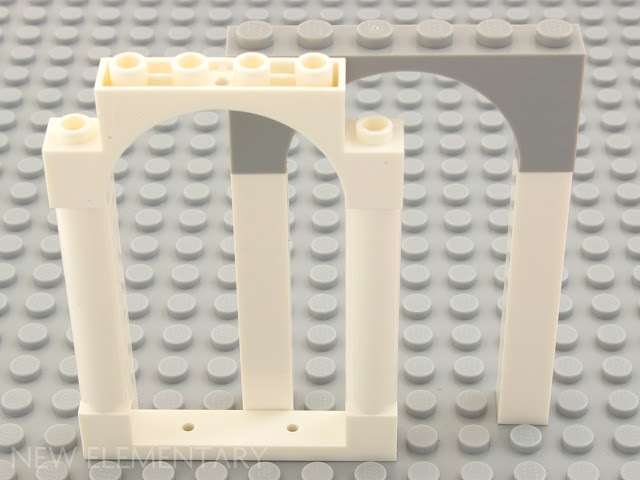 I imagine that'll be useful, both for color variation, offset to change the depth of a relief section, and even combined with the "jumper arches" from the Hogwarts Castle set. And of course I'm loving the abundance of Vibrant Coral. It's a great new color, almost like an opaque version of Trans. Fluor. Reddish Orange, and fills a previously vacant red-orange part of Lego's active color palette. 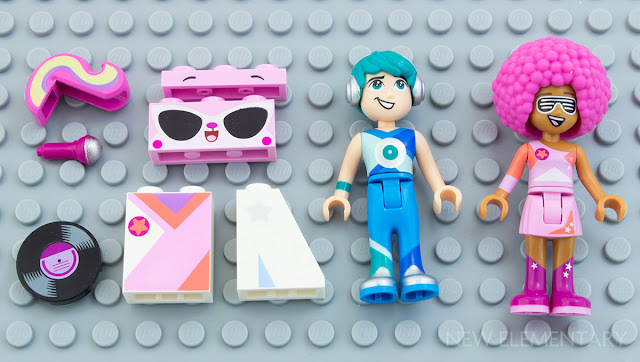 If Lego were to ever get the Steven Universe license, it'd be perfect for his iconic star shirt! As for the light brick function—I've never seen a more interesting and dynamic use of a light brick in a set! I've considered how much more you could do with this sort of function—imagine projecting a different color of light from another angle using the yellow light brick and one of the many other colors of Elves dragon egg! No mention of one of the most intriguing attributes of the new 1x6x7 arch brick: two small holes at the bottom and one at the top. The size and placement of the holes suggest to me that the arch is intended to have some sort of new window pane released for it in the future! A surprising but welcome feature of the gear plates is a triangular arrow on one of the side-facing teeth, which the instructions use to more clearly illustrate which direction the teeth should face so the studs align correctly in their default position. Having had plenty of frustration with finding the ideal alignment for Technic gear teeth in the past, it's nice to have it so plainly spelled out here, and in such a subtle way. Great review! So happy to have picked this set up! well spotted with the arch brick, hope we get window panes for it! and the gear plates are a welcome addition! I was bemoaning the 1x4 plate with two studs just this morning. My daughters were playing with the Friends hotel, but every time they switched the floors around, the 1x4 piece would stuck to the anti-studs above and not the studs below. Great update! I agree with Andrew Barnick. The only piece I've ever had missing (in 100s of sets) was just recently with the Hogwarts Castle. I was missing one of the 1x2x2 arched window panels in tan, but had an extra green 2x2 plate. I assume these are the EXACT same weight. Fortunately I had a single spare panel from an advent calendar a year or two ago so I didn't need to bother hassling Lego customer service (or cannibalizing the Modular Assembly Square for it). This usage of Light brick here is fantastic! But I beg to differ that the last time it was so good was in the 90s. The author must have forgot about the Temple of AirJitsu, 70751 with the shadow theatre, for me that still remains the best use of light brick ever. The projector screen in the Agents Mobile Command Center is another contender. Still, the reference to the old UFO fiber optic set is a valid opinion. A proper rundown of techniques for each type of light element would be a great idea to feature here sometime.